To order Official Transcripts, start at Step 1 for directions to myCCC, QuickLaunch, and then “Transcripts”. Students may obtain unofficial transcripts through DegreeWorks To order Official Transcripts, start at Step 3 and click on Parchment website to create an account. Unofficial transcripts are unavailable to former students. Students will be charged $10.00 per transcript. Additional fees may be incurred for a rush, priority mailing, or international orders. Login to myCCC with your Comet ID and password. If you need assistance with your Comet ID and password contact the ITS Help Desk. In the myCCC QuickLaunch click "Transcripts". If the Transcript button does not redirect into the "Transcript Request Link" page, from the main menu select “Student”, then select “Student Records”, then select “Official and Unofficial Transcripts”. On this page, you will have information on pricing and information for transcripts. Once you get to this page click on the link to order official transcripts. Former Students Visit Parchments website and click "Create Account". Enter your contact information. The red starred fields are required information. You are making an account with Parchment where your email will become your login id. After you have entered your information click submit. Current Students: Skip to Step 4. Type in where you want the transcript to be sent. You can also click the link "Send to yourself, Another Individual, or Third Party." If you choose yourself, the transcript will be unofficial. Select the type of transcript. If eTranscript shows in the list, then the organization will receive an electronic copy of the transcript. Please note that there is a cost for all transcripts ordered. Double click on the type you would like. Enter the order details. 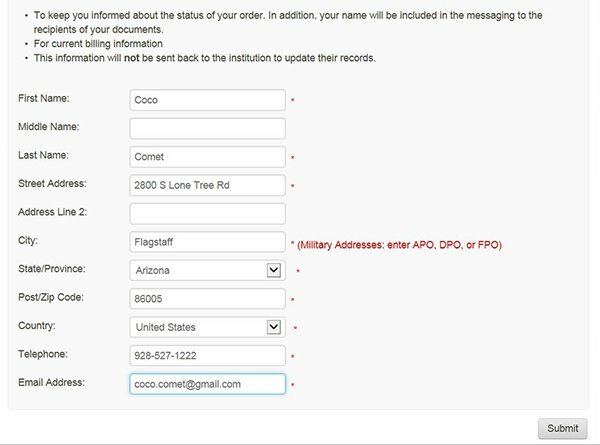 This screen allows you to make changes to address, phone, email address, etc for sending the transcript. Press continue. This screen allows you to add another transcript or make any final edits. Click Checkout. You must give your consent to Parchment to send the Transcript. Click Next. Confirm your order. Click Confirm. Finished!! At this time you can either Log Off or you can check the status of your order. In the top menu select “Order Status”. The order status shows a list of all the transcripts that you have ordered and their status. You can login to your account either from myCCC or directly into Parchment using the link in the page menu.